"Riveting and moving stuff and a wonderful antedote if you're fed up with happy clappy celebrity survivor stories and glossy cancer charrity booklets." Wishart has created something that will offer comfort to thousands: patients and their relatives may now better understand the reasoning behind some of the investigations and treatments they undergo. And by highlighting successes, medicine's aim of making cancer something we live with, not die from, seems less of a distant hope. In my view, the best doctors are those who truly remember what it is like to lie on the examination couch. If ever there was a book that could remind health professionals of patients' need for information, empathy, and humanity, this is it. Going back more than 2000 years to the first recorded cases of cancer may seem an over-zealous way to tackle a modern-day scourge. But such a step does remind us that we are wrestling with a very old and very complex problem. His father's love of science has influenced Wishart deeply, and shows itself in the close attention to detail he uses to guide us confidently through complex advances in specialties such as molecular genetics. Although some of the language used is necessarily quite technical, it is never off-putting. Jargon is well explained, and balanced nicely by excerpts from interviews with scientists who led their fields and made the past breakthroughs we now rely upon. Pioneering science aside, Wishart is brilliant at explaining the political manoeuvrings of researchers looking for funding and recognition. In the past, as today, politics, timing, and luck form more than just the background to many innovations. Although professionals will benefit immensely from reading One in Three, patients are the real targets of this part-biography, part-medical history. By bravely using his father's story to add the sparkle of humanity and reality to his immaculately researched tale of medicine's struggle with cancer, Wishart has created something that will offer comfort to thousands: patients and their relatives may now better understand the reasoning behind some of the investigations and treatments they undergo. And by highlighting successes, medicine's aim of making cancer something we live with, not die from, seems less of a distant hope. Part of cancer's power to devastate is hidden within its status as a great unknown; if we can remove some of the mystery, then perhaps we can lessen the harm it does. As I finished this book, I hoped that the author's public exposure of his own wranglings with the injustice of cancer had gone some way to answering difficult questions. And I hoped that, through writing his book, Wishart himself found some peace. Faced by his father's mortality, Adam is imprisoned by emotions. Both father and son are bound by the social stereotypes and expectations of their gender. The pursuit of understanding is the comfort zone of their relationship, and so begins the author's research into the history of cancer...... ....... One in Three offers real hope. "I love you dad." I looked at my 5 year old son and made a mental note to complain to the school about the subversive content of its discussion forum classroom activity known as circle time. I explained that he didn't even know me and that he should wait until he was at least 40 before he started making any definite commitment. He nodded, but I wasn't sure that he understood. In Britain, understatement rules supreme, and Brief Encounter—the dullest film ever made—is considered by many as our greatest love story. Emotional Americana makes many of us squirm. Adam Wishart's father is diagnosed as having metastatic cancer. Faced by his father's mortality, Adam is imprisoned by emotions. Both father and son are bound by the social stereotypes and expectations of their gender. The pursuit of understanding is the comfort zone of their relationship, and so begins the author's research into the history of cancer. Names of certain medical heroes, who have caused generations of medical students' eyes to glass over, are all here: Hippocrates, Galen, Snow, Virchow, Morgagni, Lister, Marie Curie, Farber, Doll, and many lesser known luminaries. The ancients believed that cancer was an illness of melancholy. It was not until the scientific revolution of the 17th century that these views were swept aside by the advent of medical dissection and then the microscope. Lister, influenced by Pasteur's germ theory, used antiseptics and ended the scourge of Victorian surgery—infection. Combined with new anaesthetics, effective cancer surgery became a reality and ended the butchery of the past. The chance discovery of x rays and radium at the start of the 20th century opened a new door into both the diagnosis and treatment of cancer. Chemotherapy in the 1950s cured children with leukaemia. In the 1960s, with the love-ins and the lunar landing, humanity and especially America seemed able to conquer all. President Nixon seeking his place in history (he needn't have worried) declared a "war on cancer." The search for the magic bullet against cancer began in earnest, but death rates were unchanged. Punk and industrial recession saw the optimism of the 1960s and 1970s vanish. Society began to question cancer care. The mutilating surgery, the poisonous chemotherapy, and the scorching radiotherapy had traumatised families and patients alike, with little seeming benefit, so patients turned away from conventional treatments. With the rise of alternative therapies, medicine was forced to relinquish its "monopoly on wisdom." As for the modern love affair for all things "screening," Wishart neatly explains that paradoxically the individual is never likely to benefit directly from screening. Finally he looks at gene therapy and ponders whether this is the magic bullet. The story of the author's father is woven through the book until his eventual death. Clearly, being a man and telling your father that you love him isn't easy. No circle time for us. One in Three offers real hope. "This emotionally charged account distinguishes itself not simply in the way it gracefully meshes together complex, competing theories about the disease, but in its generous use of a loved one as a case study." 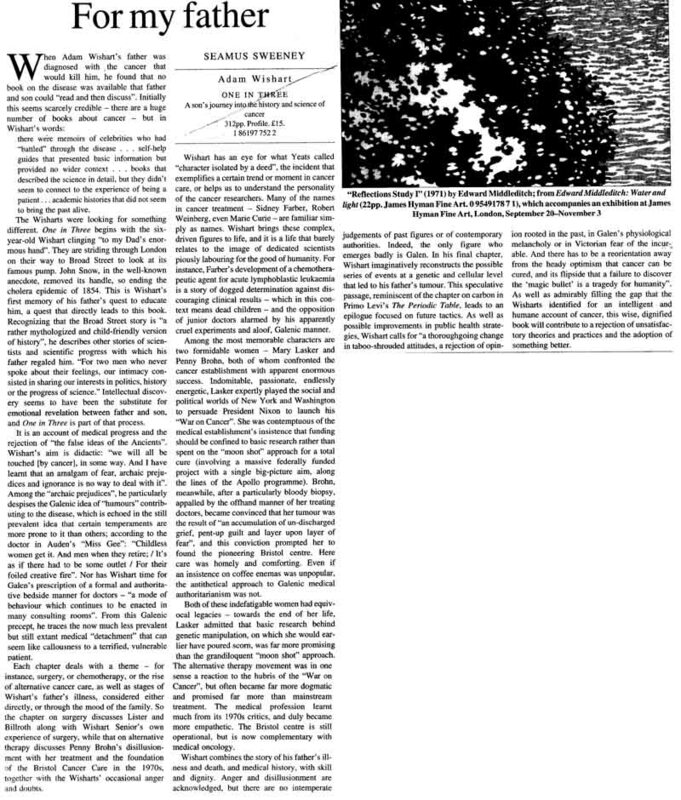 "ONE IN THREE describes Adam's attempts to understand the history, science and treatment of the illness. It is also a touching and deeply personal farewell. 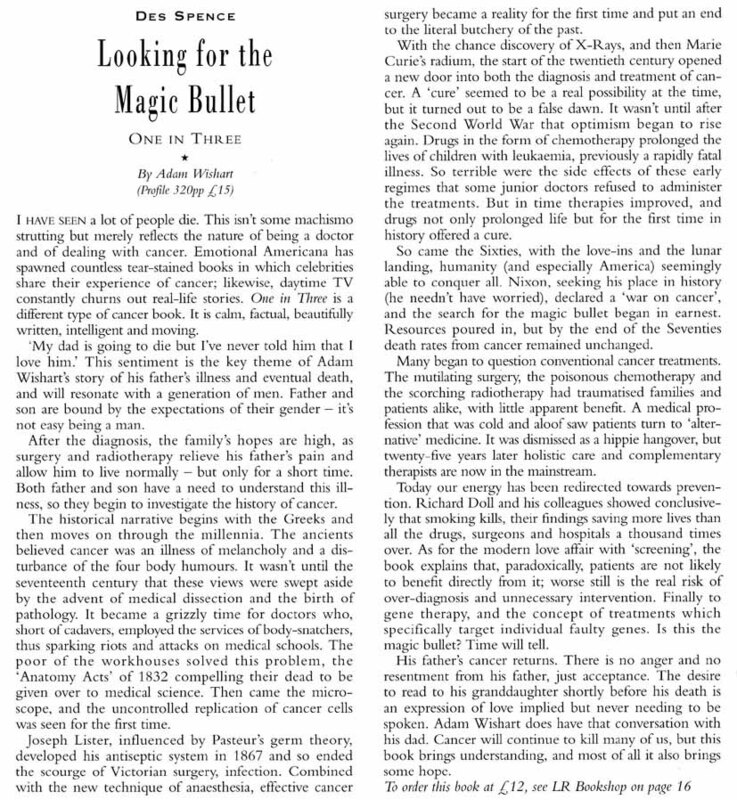 ... Wishart succeeds brilliantly in constructing a narrative that is a tribute both to his father and the scientists who have parly unpacked the mystery of cancer"
General Practitioner Des Spence wrote a lovely review in this month's literary review. "ONE IN THREE is a different type of cancer book. It is calm, factual, beautifully written, intelligent and moving. ... this book brings understanding, and most of all it also brings some hope." When I first heard about One in Three, in particular that it was a son’s personal journey into the history of science and cancer, I wasn’t sure what to expect. I was concerned that this book would be too grim or too personal. However, I am delighted to say that I was wrong; this is a fascinating book of the history of medicine and cancer and, in the end, reassuring. 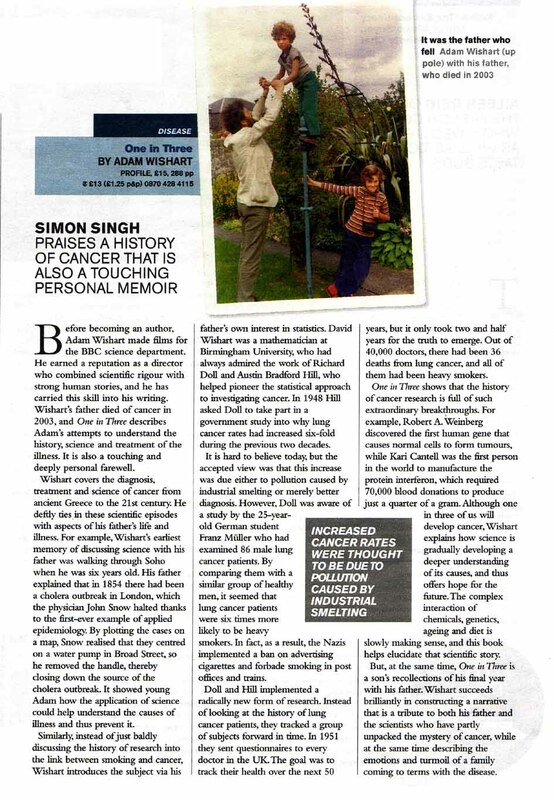 An imaginative fusion of anecdotal detail, medical science and poignant, elegiac narrative marks every chapter of this unusual book..... What emerges is a unique profile of a father-son relationship, poignantly affectionate yet utterly devoid of sentimentality. Every year a great many books are published about cancer. Scientific studies in oncology proliferate as medical science expands. There is a virtual publishing industry, moreover, in objective, information, advice, and self-help for a general readership. There are also books that tell the stories of individual sufferers; they do not make comfortable reading. Yet some accounts succeed in giving both sufferers and those close to them hope and strength. It is this cathartic effect that raises CS Lewis’s A Grief Observed (later made into the film Shadowlands), into a work of literature. And now there is Wishart’s book, which inhabits a remarkable genre of its own. "THIS book does two things well. First, it details the history of medical science's crusade against cancer, from the brutal surgery of the early 19th century to the latest work on its genetic origins, while explaining the biology of the disease and how it spreads so successfully. Secondly, alongside this the author interweaves a frank story of his father's fight against cancer. He spares few details, from the effects on his father's state of mind to the defective p53 gene in his prostate. The result is perhaps the most readable and comprehensive account out there of our battle with the big C."
David Lodge, the author of Small World, Changing Places and Nice Work, says this about my book. "One in Three shines like a good deed in a world full of unnecessary books. No disease exerts such universal dread as cancer, and yet few of us really understand its nature. By interweaving a moving, but unsentimental, account of his father’s last illness and death with a lucid history of cancer and the efforts of medical science to find a cure for it, Adam Wishart has produced a book that is informative, balanced, accessible, and absolutely riveting." Claire Rayner, long time agony aunt, one-time cancer patients and President of the Patients Association has lovely things to say about my book.